In the 19th century, soldiers of the Fulani Empire founded the Adamawa Amirate in the north of present-day Cameroon, while various other chiefdoms held power across other parts of the country. In 1884 the territory of Cameroon was colonised by Germany, and after the First World War divided between France and the UK. The former French colony won independence in 1960, and the former British colony joined with it in 1961. Cameroon has seen relatively high political and social stability since independence, with the same president since 1982. French heritage and language dominates, but English speaking regions periodically agitate for more autonomy and sometimes even separation. Cameroon has one of the strongest economies in sub-Saharan Africa. The majority of the population is employed in agriculture, much of it at subsistence scale with surplus produce sold in local markets. Favourable soils and climate have allowed plantation agriculture to flourish, with extensive export of cash crops, including coffee and cocoa. In total, agriculture contributes around 40% of GDP. Manufacturing industry accounted for some 30% of GDP in 2009. Petroleum exploitation has fallen in recent decades but is still a significant contributor to the economy. Livestock agriculture and fishing are also important, and the commercial bushmeat trade is large enough to threaten wildlife. Timber logging provides significant government income, but is relatively poorly regulated. Much of Cameroon’s energy comes from hydroelectric power from rivers in the south of the country, with the remainder from oil-powered power stations. Since the 1980s, the government has followed policies of structural adjustment and privatisation lauded by international donors and development partners. Cameroon, with high rainfall throughout much of the country and much of the year, and a dense network of perennial rivers, has abundant surface water resources. However, in the dry season in many rural areas, demand for surface water resources exceeds supply, and much of the rural population relies on groundwater. Please cite this page as: Upton, Ó Dochartaigh & Bellwood-Howard, 2018. Cameroon lies in central-west Africa, with the Gulf of Guinea forming its western coast. There is a coastal plain that extends 15-150 km inland; the south Cameroon plateau that rises from the coastal plain to more than 600 m; the Cameroon chain of mountains, hills and plateaus that extends from Mount Cameroon on the coast (Cameroon's highest point at 4,095 m) almost to Lake Chad on the northern border; the Adamawa Plateau in the centre of the country, with an average elevation of 1,100 m; and a northern lowland region, which extends from the edge of the Adamawa Plateau to Lake Chad, with an elevation of around 300 m.
Border countries Nigeria, Chad, the Central African Republic, Equatorial Guinea, Gabon, the Republic of the Congo. The climate varies across the country, controlled by topography. The upland areas have a mild climate with high rainfall. The coast is hot and very wet, with only a short dry season. The plateau areas show distinct wet and dry seasons, with lower rainfall than the coastal region. The northern lowland region is relatively arid, with low rainfall and high temperatures. 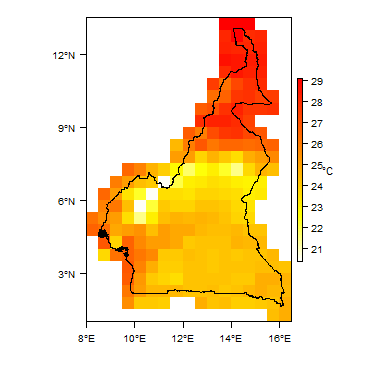 More information on average rainfall and temperature for each of the climate zones in Cameroon can be seen at the Cameroon climate page. Cameroon has a dense network of perennial rivers. The main rivers in the south of the country are the Ntem, Nyong, Sanaga, and Wouri, which flow southwestward or westward into the Gulf of Guinea. The Dja and Kadéï drain southeastward into the Congo River. In the north, the Bénoué River flows north and west into the Niger. The Logone flows northward into the Lake Chad basin, which Cameroon shares with three neighbouring countries. Cameroon also has a number of smaller lakes throughout the country. The coastal plain and southern plateau are dominated by equatorial rainforest. The upland regions have highland forest type vegetation. The dominant land cover in the northern lowland region is savanna scrub and grass. This section provides a summary of the geology of Cameroon. More information is available in the report Groundwater in North and West Africa: Cameroon (1988) (see References section, below). Douala coastal basin Cretaceous to Quaternary Composed mainly of Cretaceous marine sandstones and limestones, which are 1000 to 2000 m thick. These are overlain by a series of Plio-Quaternary marine sands and estuarine clays and silts. The two aquifers are separated by mudstones of the Nkappa formation. Lake Chad basin Cretaceous to Quaternary The Lake Chad basin contains three main geological units: a upper Quaternary-Lower Pliocene series; the Tertiary Continental Terminal; and the lower Cretaceous series of the Hamadien Continental and the Continental Intercalaire (GWP 2013). Garoua basin Cretaceous-Tertiary A lower series of clays and sandstones in the southeast, and an upper series of sandstones in the west of the basin. This is the equivalent of the Bima sandstone of the Upper Benue basin in Nigeria (Mafany and Fantong 2006). Koum, Babouri-Figuil, Mayo Oulo, Mayo Sorawel, Mamfé, Bamusso and Djerem basins These are smaller sedimentary basins. Some - eg Mamfé - contain evaporites. Volcanic massifs from the Adamaoua to the Atlantic Various ages There are a series of parallel faults running northeast/southwest, with displacements that can reach 1000 m, and associated with large volcanic massifs of various ages and compositions. These are dominantly basalts, with occasional intermediate to acidic phonolites, trachytes and rhyolites, and some loose pyroclastic and tuffaceous ash on the flanks of the volcanic centres. Lower Dja series and others Upper Precambrian This is generally un-metamorphosed, and made up of tillites with sandstones and schist intersected by granitic intrusions (the Lower Dja series). Middle Precambrian Found in the southeast, and north of the Adamaoua, around Poli, this is made up of a series of schists-amphibolites with intercalations of quartzitic sandstones and phyllites. Lower Precambrian A complex of granites, micaschists and migmatites. 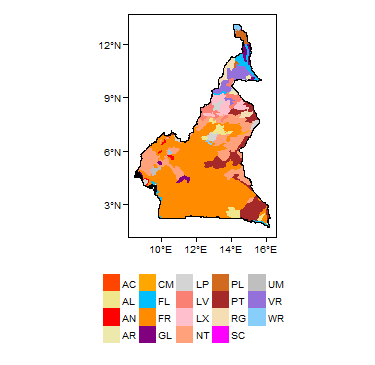 This section provides a summary of the hydrogeology of the main aquifers in Cameroon. More information is available in the report Groundwater in North and West Africa: Cameroon (1988) (see References section, below). Unconsolidated aquifers - including alluvium, marine and estuarine deposits - occur in many parts of the country, and are typically in hydraulic continuity with underlying bedrock aquifers. They are described in the relevant sections below. Douala basin - Tertiary-Quaternary Moderate to High The main aquifer in this basin is formed of unconsolidated Pliocene (Tertiary)-Quaternary sands, which form an upper and a lower aquifer, separated by a clay layer. The uppermost sandy layer is hydraulically connected with brackish waters in the Wouri estuary, and saline waters of the coastal wetlands. Occasionally, falling water tables in the dry season cause a reversal of the hydraulic gradient and seawater intrusion. The deeper aquifer is confined by the intervening clays, which is widely used for industry and domestic supplies in Douala (Mafany and Fantong 2006). Boreholes are between 60 and 200 m deep (UN 1988). The deeper Cretaceous sandstones also form an important aquifer, hydraulically separated from the overlying Plio-Quaternary by mudstones. This aquifer is not vulnerable to saline intrusion (Mafany and Fantong 2006). Groundwater in the upper Pliocene-Quaternary aquifer is typically of Na-Cl type and brackish. Groundwater in the deeper confined Pliocene-Quaternary aquifer is dominated by Na-HCO3 and Ca-HCO3 types, with typically good quality. Groundwater in the deeper Cretaceous sandstone aquifer is dominated by K/Na-HCO3 types, and typically of good quality. It is used to supplement the domestic and industrial water demand of Douala (Mafany and Fantong 2006). Garoua basin - Cretaceous-Tertiary High These sandstones form a productive aquifer, with permeabilities of around 8 to 80 m/day; transmissivities of 300 to 1700 m²/day; and a storage coefficient of 0.025. Boreholes are typically between 40 and 200 m deep. Largely acidic groundwater, with pH from 4 to 7. Very high fluoride concentrations are seen in the southwest of the basin, causing dental fluorosis (Mafany and Fantong 2006). Lake Chad Basin Aquifer - Cretaceous to Quaternary Moderate to High The Lake Chad basin aquifer contains three main aquifer units: a upper Quaternary-Lower Pliocene series; the Tertiary Continental Terminal; and the lower Cretaceous series of the Hamadien Continental and the Continental Intercalaire (GWP 2013). The basin is shared by Chad, Niger, the Central African Republic, Nigeria, Cameroon, Algeria, Sudan and Libya. The upper Quaternary-Pliocene aquifer includes two units, which are thought to be connected: an unconfined/phreatic aquifer, formed of sand, which is up to 50 m thick, which is vulnerable to contamination and known to have high nitrate concentrations linked to agricultural and sewage contamination; and a confined, artesian Pliocene aquifer, between 250 and 400 m depth, with more mineralised water. Artesian pressure is being reduced, possibly due to over pumping. Recharge occurs to the confined aquifer only in limited areas (GWP 2013). The middle Continental Terminal, of Tertiary to Quaternary age, comprises alternating sandstone and clay layers, which are 450 to 620 m from the surface (GWP 2013). Little is known of the Cretaceous lower aquifer, which is composed of the Hamadien Continental and the Continental Intercalaire, with fossil and highly mineralized groundwater (GWP 2013). Small sedimentary basins - including Hama Kossou, Babouri-Figuil, Sorawel, Mayo Oulo and Mamfé - Cretaceous Low to Moderate These basins generally form low to moderately productive aquifers, capable of borehole yields of up to 5 m³/hour. Many springs occur. Abstraction boreholes in the Hama Kossou, Babouri-Figuil and Mayo Oulo basins are typically between 120 and 180 m deep. Groundwater quality is generally good. The local presence of evaporites in the Mamfé basin leads to groundwaters of sodium-chloride composition (Mafany and Fantong 2006). Volcanic rocks of various ages Moderate to High Volcanic centres form moderately to highly productive fractured/weathered aquifers. Many springs emerge from hill slopes, some of them thermal (Mafany and Fantong 2006). Generally sodium-bicarbonate or iron/magnesium/calcium-bicarbonate type. Metamorphic crystalline basement - Precambrian Low (locally moderate to high) Crystalline rocks cover most of Cameroon, sometimes covered with alluvium and other unconsolidated deposits, and laterite. They typically form small, local aquifers, limited to areas where the rock has been fractured and weathered to increase its permeability. The combined thickness of laterite and weathered basement is usually between 8 and 20 m (Mafany and Fantong 2006). Below this there can be a deeper fractured aquifer, which usually has low permeability. The best yields are found where fractured rocks are overlain with a thick weathered zone or thick alluvium. Borehole yields are usually 1 to 3 m³/hour, in the region of the Mandara mountains, but can rarely reach 30 m³/hour in places in the Kribi region, associated with large faults (UN 1988) Groundwater usually has low mineral content, with total dissolved solids rarely exceeding 300 mg/l, and conductivities generally between 30 and 350 uS/cm. The water is usually of magnesium-carbonate type (Mafany and Fantong 2006). Of the 322 billion cubic meters of total available water resources, groundwater constitutes 21% (57 billion cubic meters) of this resource (Ako Ako et al. 2009; Sigha-Nkamdjou et al. 1998). 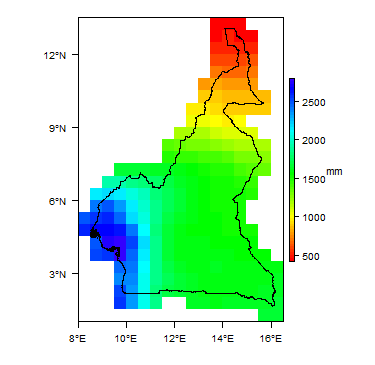 High rainfall means high potential recharge potential in much of Cameroon, except in the arid north, and the limitations on groundwater potential are therefore largely related to low aquifer storage and permeability in the basement rocks across much of the country. In the northern region, increasing population combined with a reduction in the quantity and regularity of rainfall has resulted in persistent drought and reduced groundwater resources (Ako Ako et al. 2009). Most groundwater in Cameroon is thought to be of good natural inorganic quality. The least mineralised groundwater overall is in basement aquifers. Some of the most mineralised groundwater is in volcanic aquifers, but the most mineralised are springs in the Mamfé basin that are related to evaporites. Some groundwater in deeper aquifers contains low oxygen and corresponding high iron and even hydrogen sulphate gas (Mafany and Fandong 2006). However, much of the shallow groundwater is vulnerable to contamination. Shallow coastal aquifers are subject to seawater intrusion. There is no evidence for widespread inorganic contamination of groundwaters, even in urban areas, but there is widespread bacteriological contamination of shallow groundwater in urban areas, such as Yaoundé and Douala, derived from domestic, industrial and hospital waste (Mafany and Fandong 2006). 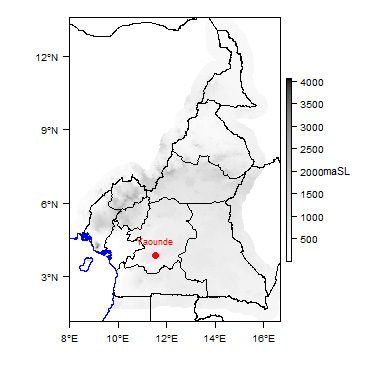 In Douala, studies have shown nitrate pollution (Wirmvem et al. 2017) and organic pollution (Sanou et al. 2015) of groundwater. 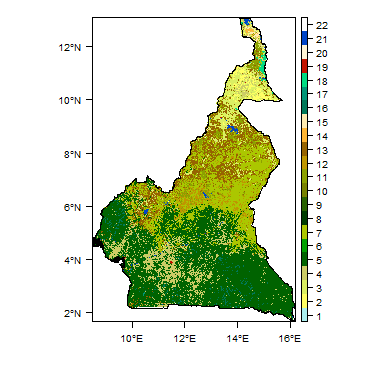 A BGR project funded by the German Federal Ministry of Economic Cooperation and Development (BMZ) investigated groundwater quality related to health in Yaoundé and produced a number of reports. The rural population largely relies on groundwater for water supply, through springs, hand dug wells, and boreholes equipped with hand pumps (Ako Ako et al. 2009). Some urban centres widely use groundwater, including Douala. Groundwater from volcanic aquifers is widely used by the bottled water industry. The Ministry of Mines, Energy and Water (Ministère des Mines, de l’Énergie et de l’Eau), has responsibility for water supply and sanitation in both rural areas and towns through the Directorate of Directorate of Water (DE: Direction de l’Eau). In recent years, the former National Water Supply Company of Cameroon (SNEC: Société Nationale des Eaux du Cameroun) has been privatised with the creation of the Cameroon Water Utilities Corporation (CAMWATER) with responsibility for public water supplies in urban areas; and the responsibility for the construction and management of rural wells and boreholes has been transferred to communes (AMCOW 2011). In northeast Cameroon, the Lake Chad basin aquifer is shared with neighbouring countries. A number of agreements and cooperative activities exist between these countries (e.g Alker 2008). The following references provide more information on the geology and hydrogeology of Cameroon. Molua EL and Lambi CM. 2006. 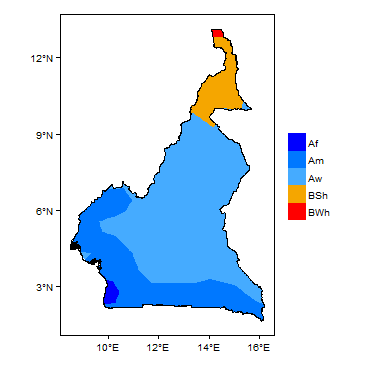 Climate, Hydrology and Water Resources in Cameroon. Sanou, S M, Temgoua, E, Guetiya, W R, Arienzo, A, Losito, F, Fokam, J, Onohiol, J F, Djeunang, B, Zambou, N F, Russo, G, Antonini, G, Panà, A and Colizzi, V. 2015. Water supply, sanitation and health risks in Douala 5 municipality, Cameroon. Igiene e sanita pubblica, 71(1), 21-37. Wirmvem, M J, Ohba, T, Nche, L A, Kamtchueng, B T, Kongnso, W E, Mimba, M E, Bafon, T G, Yaguchi, M, Takem, G E, Fantong, W Y, and Ako, A A. 2017. Effect of diffuse recharge and wastewater on groundwater contamination in Douala, Cameroon. Environmental Earth Sciences, 76(9), 354. This page was last modified on 18 February 2019, at 11:27.